Releasing version 1.4.2 to production. 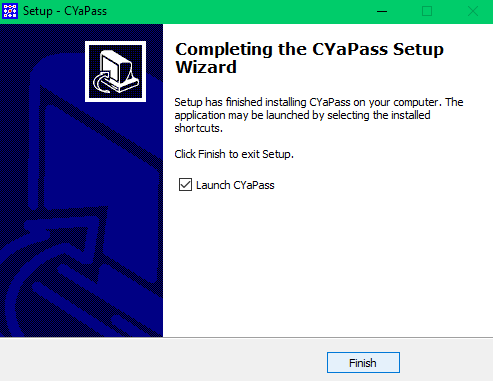 You can download the latest Windows installation package here at: http://www.cyapass.com/downloads/CYaPassInstall_v142.zip. The download is only 0.5Megabytes (500K). That download is a zipped up installer. After you download it, you'll need to unzip it and run the included installer executable. That will install C'YaPass for you and set everything up. Version 1.4.2 now sorts the Site Keys for you automatically so they are easier to find in the list box. I now have over 37 passwords for different sites in mine and it was really annoying to try to find certain ones since they weren't sorted in any way. All Site Keys are now sorted alphabetically. Previously they were just added to the bottom of the list as you added a new Site Key. Just unzip the two files and drop them in one folder anywhere on your drive (or even a flash drive) and run the app from there. Version 1.4.1 was released to production. Update Note 3: On September 25, 2017 I added new functionality and built the new version (1.4.1.0) that allows you to set password requirement reminders for sites. Unfortunately many sites require a shorter (max length) password, uppercase character and/or special characters. It is often quite difficult to remember each of the various site's requirements. Now you can set those so in C'YaPass and the options will be auto-selected when you select the Site Key. Updating To New Version : Please note that you can safely run the new installer over an older version without fear of losing your site keys. The new version will be installed and your site keys will not be affected at all. When the new version starts you will see the original list of site keys you previously entered. Update Note 2: On July 19, 2017 I updated the app with an enhancement (v1.3.0.0) so you can now hide your drawn pattern. 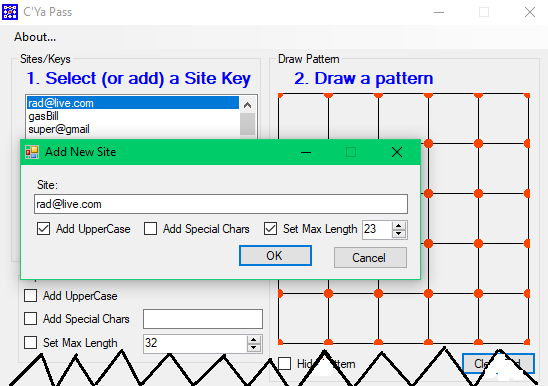 Once you draw the pattern you simply click the [ x ] Hide Pattern checkbox and your pattern won't show up on the screen. 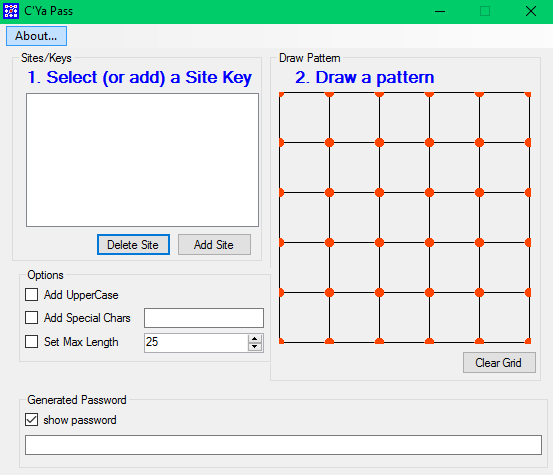 Of course the app will still generate your passwords for you but now if someone is standing behind you or at your computer you can freely generate your passwords without fear that they'll learn your pattern. If you had the previous version, you can get the installer and it will install over the top of your previous one without any loss of your site/keys. Or, if you prefer, get the zip at the bottom of this page and drop the new .exe in manually. Want to know all the intimate details about what the installation package does? Windows will warn you that you are downloading a zip file and it could be dangerous. But since you know it's from the official C'YaPass site it is safe. 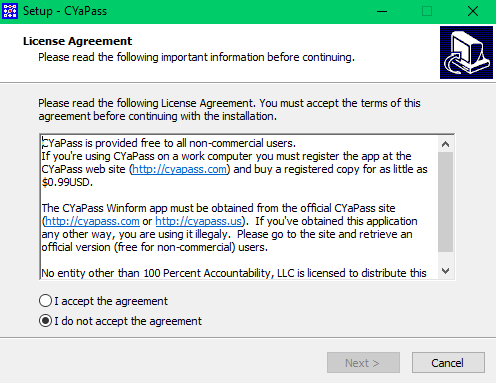 Next, Windows 10 will warn you when you attempt to run the CYaPass Installer that it could be dangerous. Click the [Run anyway] button since you know this is a safe source. 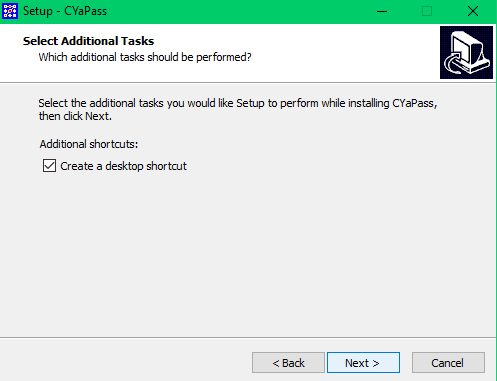 Windows will flash away to a screen to ask you if you really want to install CYaPass software. Confirm that you do want to install and the following install screen will appear. Here are the rest of the screens which will walk you through the installation. Finally, if you click the [Finish] button (and leave the Launch CYaPass checkbox checked) the applicaton will start.